Steven O'Brien drills home Tipperary's first goal after only 90 seconds against Donegal at Semple Stadium on Sunday last. Wing-back Jimmy Feehan makes the run in support. 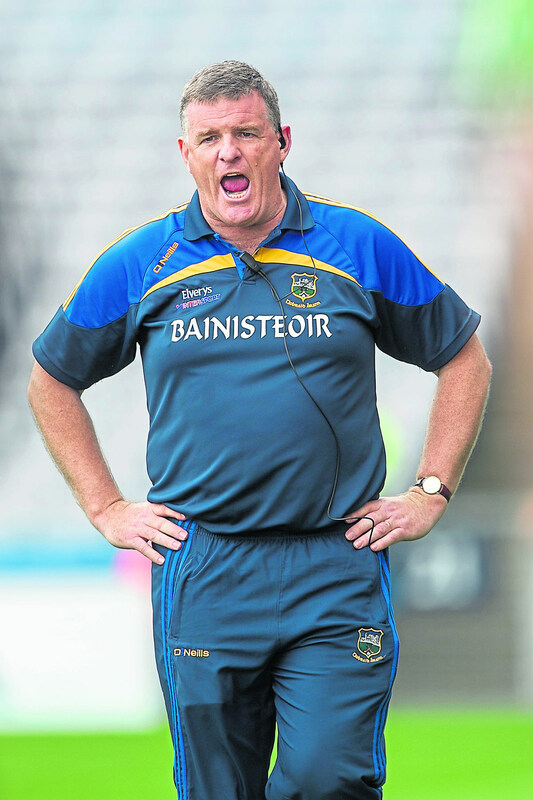 Tipperary team manager Liam Kearns was rightly delighted with his team after Sunday’s hugely important win over Donegal in Division 2 of the National League at Semple Stadium played before an attendance of just 1,403. “That’s a big win,” he started “We left a point behind us against Fermanagh here and the onus is on you to win your home games. We are 10 players down so to beat Donegal who were top of the table with four points coming in here and favourites for promotion. All the credit goes to the players; the players did a fantastic job. The Tipp boss was also delighted with his stand-in goalkeeper’s performance, young Michael O’Reilly making his first start for the county at senior level after Evan Comerford’s injury against Fermanagh the previous Sunday. In fairness Liam Kearns also acknowledged the significant break his side got with the second goal which came in the 18th minute of a second half in which Tipperary had not scored up until then. Tipperary football manager, Liam Kearns. “It was the break we got for the goal. At that stage we were pushing up on them and then we went after them after the goal and we won it fairly comprehensively in the end. But they controlled it - they are experienced players - in the first half of the second half and ultimately we won it by five points. You have got to be happy with that,” he added. “That goal gave us great impetus. We got 2-5 to 0-2 (in the final quarter) and that was fair clipping. We have been disappointed with our two performances to date. In Meath we were very poor in the middle third and the last day (v Fermanagh) we were really poor upfront missing goal chances. All credit to the players that’s what won the game. Their backs were to the wall and they came out and performed, they came out fighting, and I would never doubt their character or their ability to bounce back. They are a great bunch of players who will always give their all. “I would have been talking to you about relegation if we had lost here today. I think this division is all over the place now. Everything is up for grabs now still, promotion and relegation and mid table. To me we need three more points to do what we want to do which is stay in Division 2 this year. We are only halfway there but it is great to have three of them after today. “There is great credit due to my players because they came out with the attitude and if they didn’t have the belief that they could have won the game they wouldn’t have won it. And I still think Donegal are probably favourites to win promotion. They were missing some massive players and I consider them a Top 5 or Top 6 team in the country so. I am delighted with my boys that they managed to win this even though Donegal are missing as many players as they are. For Michael Murphy you can say Michael Quinlivan, for Odhran MacNiallais you can say Robbie Kiely, for Paddy McBrearty you can say Bill Maher. Evan Comerford is out, Shane O’Connell is out, Josh Keane is out. There are huge players missing for us and to be able to come and win a game against that kind of opposition says it all about the players. I am happy that we won,” reflected Kearns. “I gave them a lot of stick for their performance against Meath and in fairness to them that is the kind of character they have. They went out and they performed really well against Fermanagh and they followed it up with another big performance here today. “But that’s the character they have, these guys have lots of character and I don’t think people appreciate how good they are either. They are not getting credit for what they are doing and how they cope with the step up in games all the time. At the end of the day we were only a kick of the ball away from Division 1 last year. We were probably the best team in Division 2 last year. OK we don’t have our players this year and I am not saying we are the best team in Division 2 this year but if we get all our players back we will be a match for any team in Division 2,” added the Kerryman. Paul Maher is the only one I will get back and I would say Armagh. Heading towards the last two games - there is a break of a week between the next two and the last two - and I might get Michael Quinlivan and Shane O’Connell and one or two more but it will be as long as that before we get there. We are going to Armagh next and home advantage is a big thing. Donegal had a long trip to come here today and it definitely is a big help to be at home,” concluded a well satisfied Liam Kearns. Post-match Steven O’Brien was as much delighted with the performance as the result. Commenting on the win immediately after the game the towering and influential midfielder said. “It was massive. It was our third game and we badly needed the points. The second goal was a touch of fortune and you need the bit of luck in all these big games,” said the Ballina man.